PR is the way that companies get the press to notice them. All PR gets you noticed. But some PR won't get you noticed in the way you want! PR doesn't have to be expensive. The photographs here show a bit of PR from a certain film manufacturer (guess who) a dozen years back. 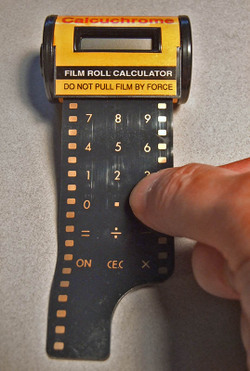 A working four-function calculator built into a film canister: the original "digital film!" The film's a membrane keypad; you squeeze the symbols to enter them. It works faster than you'd think. Those things cost about as much to the company as a single mailed press release did, and the press loved them. Mine finally died, so I took apart for your benefit and to see what I could do. The dead battery was easy. The partially disconnected ribbon connector to the LCD display, unfortunately, is probably beyond my skills to repair. I'm going to show it to a genius friend of mine just in case he may be able to fix it. I'm really enamored of it. Then there's bad PR. Consider the late, unlamented Fred Picker, whose products got a lot fewer reviews than they would have if he hadn't been such a royal pain to deal with. If you have two meritworthy products and one space for only one review you go with someone who is pleasant not who is an aggravation. I'm signed up as press for MacWorld Expo, which means I get emailed tons and tons of press releases. Ninety percent of them have nothing to do with me; that's true for most of us press. Companies no longer have a financial interest in winnowing the mailing list, what with e-mail. It's a cost of doing business we accept, although we may look more favorably upon companies that do pay some modest attention to who they're contacting. Last Tuesday I received a press release for a music product I'd not ever be reviewing. I sent my usual form reply that says "unsubscribe" in the subject line and says "Please unsubscribe, thanks!" in the body. This cuts way down on the amount of junk mail I get over the course of the year. "You have set me four emails for the same goddam product. You have ignored three unsubscribe requests. I have reported you to my ISP as a spammer. Go to hell." That finally got the attention of the PR person, who apologized but claimed that she had never seen any of the three "unsubscribe" emails (yeah, sure) and obviously had no clue that sending out four press releases for the same item was extremely inconsiderate. I'm not mentioning the name of the company nor the product, because I have no intention of giving them any free publicity. They got noticed, all right. Featured Comment by Erlik: "'Companies no longer have a financial interest in winnowing the mailing list, what with e-mail. It's a cost of doing business we accept, although we may look more favorably upon companies that do pay some modest attention to who they're contacting.'" "What we'd look more favourably upon are the companies that don't send the same PR to ten people in the same magazine. And then go telephoning each of the ten people after half an hour asking whether they received the PR and when it will be printed. "Or the companies that don't send multi-megabyte ad images with their press releases unasked. "Or that the same companies then don't waffle for two weeks getting images from some event to you while your deadline screams towards you like a cruising missile. "Or the companies that do not send elaborate pictorial flyer-invites in attachments when two lines of text would suffice. "Or the companies that do not put the same two lines of text in a DOC attachemnt while in the mail they explain that we can read what they want us to read in the attachment. "Or the companies that do not put ten lines of stupid disclaimers under one line of text. "Or the companies that don't put the whole of their mailing list in the CC field instead of creating a mailing list or at least putting everybody in BCC. "Or the companies that don't organize their press conferences in the middle of a work day at the end of the month when every magazine is in the throes of finishing the next issue. An hour's drive away, at that. "Or the companies that do not organize whole-day events at the same time of the month and then insist you have to come. Or the companies that do not organize press conferences in the centre of the town at midday, when you can't find parking space for love or money. "Endless are the follies of PR people...."
Ah! 'unsubscribe' - translation: 'Continue sending me as much junk as possible'. I usually click 'unsubscribe' when the unwanted first arrives (just for a laugh). When the next one invariably appears, I add the address to 'delete automatically' in my mail filter. There is an amusing side to the use of 35mm film cannisters in a mailshot... 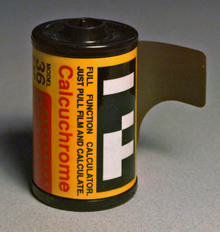 I remember I knew a photographer who sent out 35mm cannisters with a 'film' paper strip with a 'Happy Christmas' message printed on it. Many clients returned them to him with a note saying it must have been sent in error, but dont worry they had not exposed the film! "late, unlamented" - ouch ! I kept thinking there would a point to this post, then I got to the end. Don't know much about PR, never having been on either end. 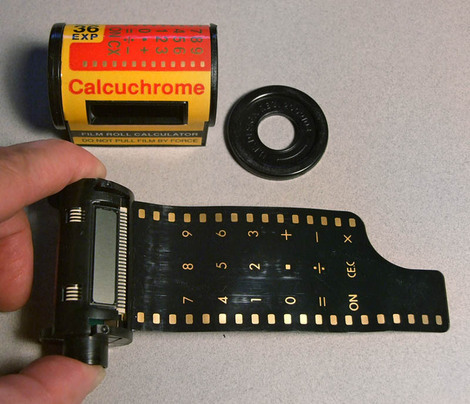 But that Calcuchrome reminds me of a product promised around 2001 that would have been a digital sensor/storage mechanism in the form factor of a 35mm film cartridge. 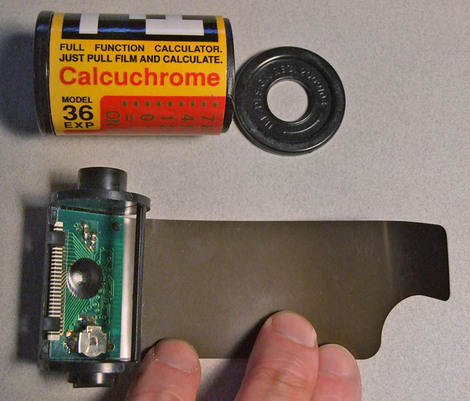 It would have allowed any 35mm film camera to be transformed into a digital camera. Unfortunately it remains (patented) vapourware as the company behind it went bankrupt. I continue to hope it eventually arrives on the market. Unless you live in the EU [or is it just Germany? ], where companies are obligated by law to put in an endless sermon of completely uninteresting information on the company. It was already bad enough seeing theis stuff in 5 point serifs on every damn letter, but since last year they have to put in all the nonsense in every e-mail, even the ones just saying, 'Approved'. Dierk, I know that they are obliged to put that stuff in either by law or by company rules. I just wish they didn't. We sometimes come to hilariously silly situations like you getting some info for the papers while in their signature there's a stern warning not to use the info in public or you'll feel the wrath of God. Bureacracy combined with PR is... is... leaving me speechless. Ah yes, that was announced by Irvine Sensors back in 1998. They set up a subsidiary to do the product development and marketing, which folded several years ago. But I.S. is alive and kicking. I.S. was one of the very few companies that could pull this off. Their specialty was super compact and low power sensor systems for aerospace. They really could cram the necessary electronics and memory into a film cannister. I'm not sure anyone else could have at the time. What killed them was the development lead time. Digital camera prices were crashing so fast back then that every price/performance target they set for themselves became uncompetitive before they could get the product out. They were stuck in perpetual development purgatory. Today, such a device is not economically attractive. Large sensors are still too expensive. Check back in 5 years or so.